As you know we love a train story on Gfb. Well, here is a little ditty from the Queensland Rail authority urging safety on the tracks. And a shorty on train etiquette! The Christmas #1 Is Re-re-re-re-released! This is where it all started – our chart sensation which failed to trouble the charts a couple of years ago. Time for a re-re-re-re-release! How many can you name? Cash prizes could be on offer. Maybe. Perhaps. Not Really. Classic 70’s movie making in which the now legendary Chico Chicken, struts his stuff in cockle doodletastic fashion. Crowds flocked to see it. There is a sad end when Chico ends up as a KFC Family Bucket for his main protagonist, David Niven, (playing his last major screen role) who cavorts around with a Wagon Wheel on his head. With music by the Bee Gees including the classic ditty “Ha, Ha, Ha, Ha Layin’ Tonight, Layin’ Tonight,” SNC became a box office smash. “You’ll believe a chicken can dance,” The Delaware Doubter. 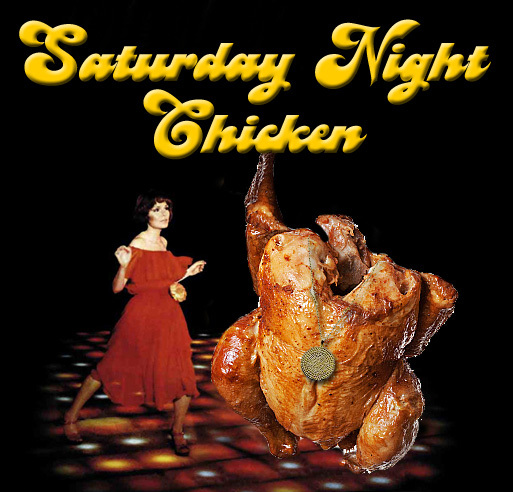 “The most realistic depiction of chickens dancing to disco music I have ever seen!” The Houston Chronicle.